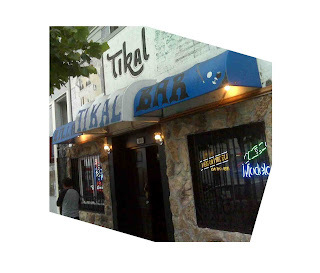 I got a kick out of the fact that on US Independence Day I was entering Tikal Billiards Bar on Mission Street which is owned by an El Salvadorian (Maria), is named after the largest of the ancient ruined cities of the Maya civilization located in Guatemala and the guy sitting next to me (Gabriel) is Mexican. 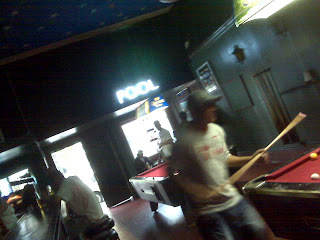 We were celebrating Independence Day by drinking beers, playing pool and chillin. Tikal was a major cultural and population center for the Maya civilization and so it is appropriate that this bar had its own culture and a very interesting population. Culture: Tikal is family owned and operated. Maria has owned the bar for over 21 years and bartends it with her daughter, Jessica, as her other daughter managed some of the bar back duties. Maria also manages the money, not the till but anything over $20 goes to her and she breaks it as needed. That reminds me a lot of Mexico and how my aunts and uncles would do the same when running their shoe shops in the market. The Virgin Mary portrait with fresh roses purchased daily from the gal who stopped by is a cultural staple. The “bartender handshake” has happened more frequently along my journey. At three of the five bars visited the bartenders have given me a handshake and introduced themselves while taking my order. It was very obvious at Tikal because both Maria and Jessica did this. I usually only shake hands with bartenders after I’ve been there a number of times and it is me initiating the interaction. On Mission Street it’s been the opposite. I wonder if this happens when it’s busy too or only happening because it’s early in the evening and there are only a handful of us around when it occurs. Then again, maybe it’s the culture. The fourth drink is free. I don’t know if that should be under Culture but at the first couple bars a fellow patron bought a round and at the last three it was the bartenders. I know it’s always good to make friends early but I haven’t been doing it to get the free booze that’s just a nice surprise. Population: Approximately 10-12 when I first entered. 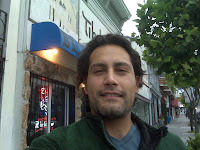 Gabriel, my barstool neighbor, knew Maria personally and from what I could gather in our conversation was dating Maria’s niece. I can’t be sure this is true because the music was very loud and he was speaking in drunken Spanish. Of the many drunken guys the one who stood out was in an open button up bowling shirt with white tank playing pool and trying to grab at Jessica to dance with her. He was soon booted from the bar and last I saw him was passed out on the bench at the bus stop. The tables were busy with many players waiting to play a unique game of 8 ball. As I was mustering up the courage to play I noticed that the games would take some time to finish. To end the the game the winner has to bank the cue or 8 on the last shot. I've got something new to practice now that I know the rules. I did practice at my neighborhood bar later that evening so watch out Mission Street I’ll soon be throwing my quarters down. Between the beers, the bar, the tables and the juke box there was plenty of entertainment in this dark little bar. What the bar did not have was a TV, Tequila (no hard alcohol), bright lights, Mariachis popping in and the traveling food guy. I took a peak at next week’s bar and unless one pops up before Friday it should be a doozy with a lot more dancing at Club Malibu. Where, oh where, is that traveling food guy? I long for his reappearance.